Inspired by the shields wielded by the 10th to 12th century Normans and sporting a dynamic, medieval heraldry-inspired look, the Red Lion LARP Shield is a trusty defense to have on your arm at your next live action roleplay event. Its sturdy construction consists of hard EVA foam coated in resilient latex. The pattern on its front is laser cut and then hand painted in a bold red, black, and white design featuring lions and fleur de lis. Due to its hand painted nature, there may be slight variations to this LARP shields appearance. 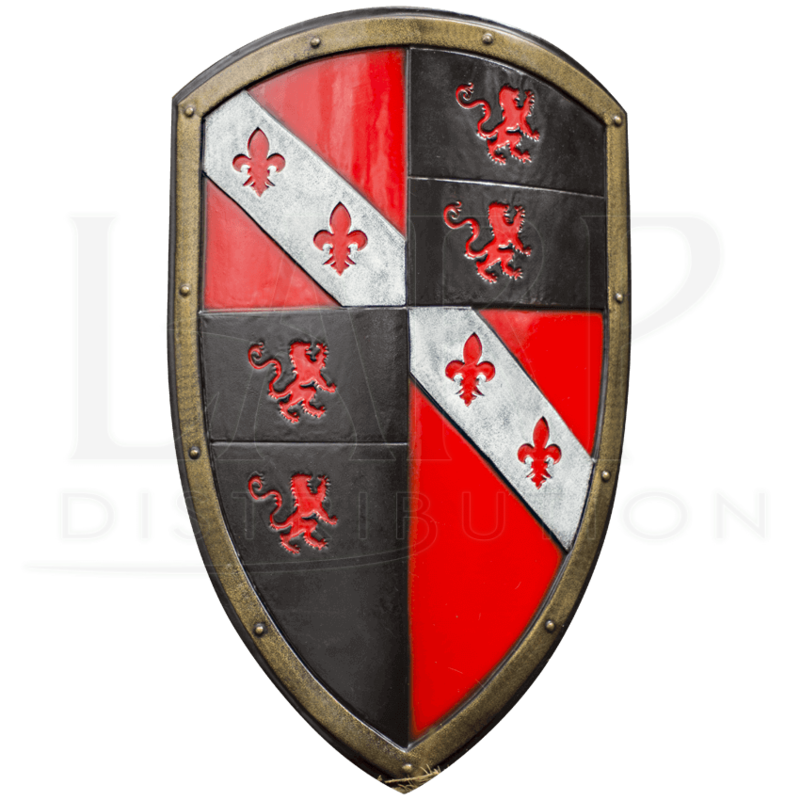 Extremely versatile, the Red Lion LARP Shield can be used either right- or left-handed with its many adjustable leather straps. Resistant to shredding and constructed with attention to safety, this live action roleplay shield is an ideal defense for any noble or knightly LARP character. This LARP shield is approximately 31.1 inches in overall length. This measurement will vary as each LARP item is handmade. Latex items need to be maintained to a certain degree. We offer a Maintenance Silicone (MCI-2000) that can be purchased separately in the LARP Accessories section. We recommend that you use this Silicone on a regular basis. It has an easy, spray on application, and it will keep the coating flexible, extending the life of the shield. The maintenance silicone also helps the shield resist general wear and tear from normal use.